Hydrogen fluoride is used as a catalyst in the production of detergents. The process has a number of parallels with the petroleum alkylation process, except that in this case, linear alkylbenzene (LAB) is produced. This is used mainly in the manufacture of linear alkylbenzene sulphonate (LAS) detergents for laundry and dishwashing applications. 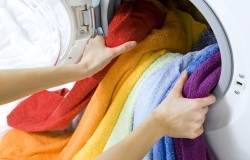 Compared with a traditional detergent such as soap, these products are more soluble in water. This solubility allows them to penetrate soiled articles much more efficiently. The action of a detergent depends largely upon the presence of a polar and a non-polar component in the molecule. The polar component attracts water, while the non-polar component attracts oils and greases. In this manner an emulsion is formed in which dirt can be effectively washed away. In both petroleum and detergent applications there is some loss of catalyst due to conditions of operation. This means there is a continuing demand for hydrogen fluoride.